Great Place to Work® Institute has honored Legend Senior Living with accreditation as a Great Place to Work. This institute recognizes outstanding workplace cultures and produces the annual Fortune "100 Best Companies to Work For®". Over 1,000 employee surveys from across all forty Legend locations were accessed. More than 60 individual elements of company culture were evaluated including employee pride in the organization’s impact, belief that their work makes a difference, and feeling their work has special meaning. Rankings are based on employees’ sentiments, no matter who they are or what they do. “Legend Senior Living employees serve residents with great care and compassion. These values are present in all levels of our organization. 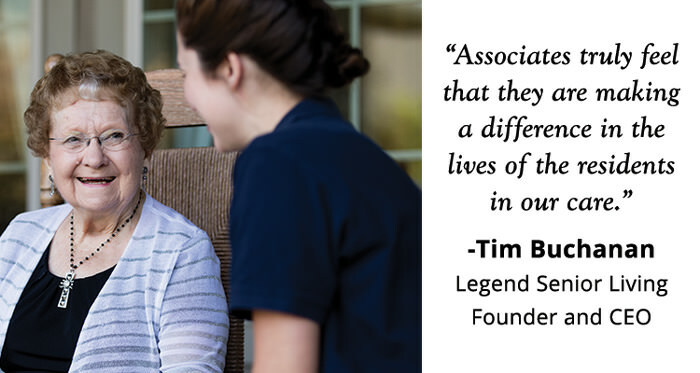 Associates truly feel that they are making a difference in the lives of the residents in our care.” said Tim Buchanan, Legend Senior Living Founder and CEO. Great Place to Work is the global authority on high-trust, high-performance workplace cultures. Through its culture consulting services, Great Place to Work helps clients create great workplaces that outpace peers on key business metrics like revenue growth, profitability, retention and stock performance.